White Tailed Sea Eagle about 1 Kilometer north of Bealick near the source of the Roughy River. These birds are one of the biggest Eagles one can see and have a wingspan of 8 feet. We watched it ride the air currents for 10 minutes or so and it was a pity we had to move on. 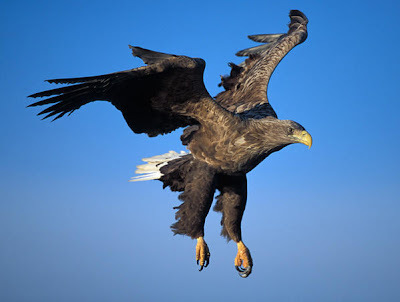 I entered the sighting on the web site http://www.goldeneagle.ie/ they have a section on the Sea Eagle and welcome the reporting of such sightings. These birds have been re-introduced to the Killarney national Park as chicks and some have been tracked by GPS and shown to have traveled as far as the north of Scotland and returned again.